The total increase of 295,000 jobs is an overall increase compared to an average monthly gain of 266,000 over the past year. Jobs increased in health care, food services and drinking places, construction, business and professional services, and in transportation and warehousing. Employment in professional and technical services rose by 32,000 in February. The unemployment rate is at 5.5%, and the number of unemployed individuals is at 8.7 million. Both numbers have trended down in February. Over the course of the year, the unemployment rate and the number of unemployed were down by 1.2 percent and at 1.7 million, respectively. Employment in financial activities saw a gain of in February, which is in line with its prior 12-month average increase of 13,000 jobs. In fact, financial activities have recovered 56 percent of the 718,000 jobs that were lost between December 2006 and February 2011. Employment in professional and business services saw an increase of 51,000 in February and has seen an overall gain of of 660,000 over the past 12 months. In February, employment continued to trend up with management and technical consulting services seeing a gain of 7000, computer systems design and related with an increase of 5000, and architectural and engineering services seeing an increase of 5000. 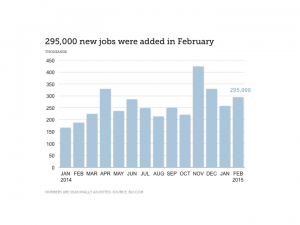 In February, employment in retail trade continued to trend up with 32,000 additions. Over the past year, the industry gained 319,000 jobs, which brings February’s employment level to just 19,000 under the peak in November 2007. Over the past year, the number of long-term unemployed trended down by 1.1 million people. This number, which is defined as a person without a job for 27 weeks or more, was unchanged in February at 2.7 million. These individuals accounted for 31.1 percent of the unemployed. The civilian labor force participation rate remained relatively in February at 62.8%, and has remained within the narrow range of 62.7 to 62.9% since April of 2014. The ratio of employment to population was constant in February at 59.3%, but has seen an increase of 0.5% points over the year. In February, the average workweek for employees on private nonfarm payrolls was 34.6 hours, which has stayed steady for the fifth month in a row. The manufacturing workweek was not changed and has remained at 41.0 hours. Factory overtime decreased by 0.1 hour to 3.4 hours, and the average workweek for production and nonsupervisory employees on private nonfarm payrolls was steady at 33.8 hours. The average hourly earnings for all employees on private nonfarm payrolls was $24.78, an increase of 3 cents. Over the past 12 months, average hourly earnings have risen by 2.0 percent. In February, average hourly earnings of private-sector production and nonsupervisory employees were unchanged at $20.80.